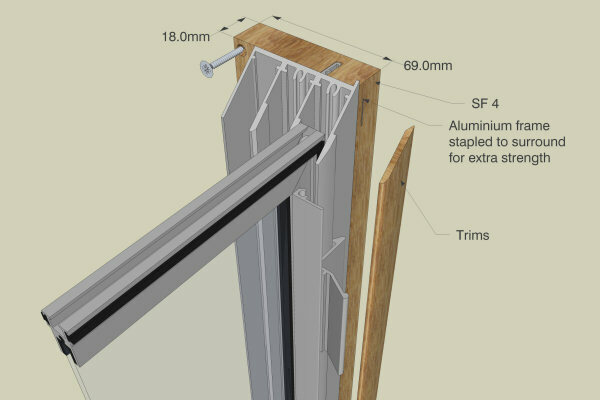 The wooden subframe wraps the aluminium frame and actually gives increased sound and thermal insulation, as the wood helps to absorb sound. It comes in three depths, either a slim SF1, the deeper SF3 or the even deeper SF4. 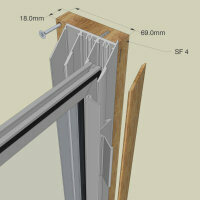 The depth you require depends on whether you wish to face fix or reveal fix your secondary glazing. The wood used for the subframe is either MDF (Medium Density Fibreboard), Tulip (a pale hardwood), or solid Oak (hardwood). 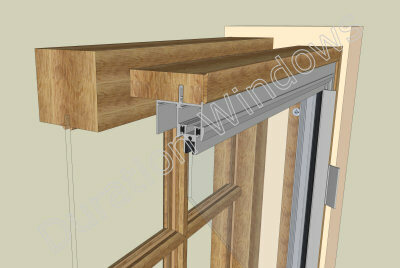 MDF is the cheapest option, is easy to trim and paint. The hardwood options provide a nice wood finish, with a natural grain that can be varnished, oiled, stained or painted. 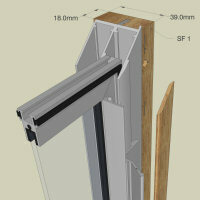 Most of our secondary glazing units use our SF1 subframe. 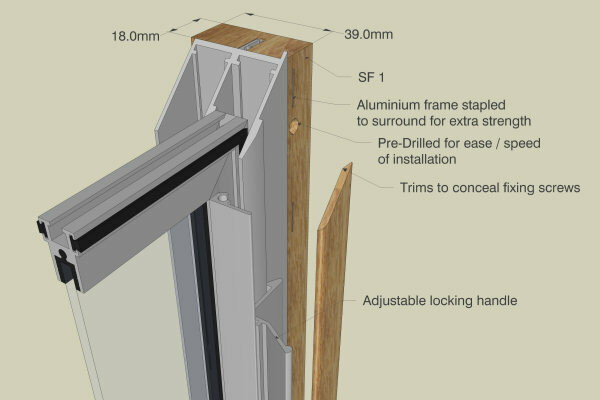 This is designed to screw directly on to your existing windows (known as face fixing), whilst the SF3 subframe is designed for screwing into the wall slightly away from your existing window (known as reveal fixing). The SF3 subframe protrudes out 16mm from the back of the secondary for fixing through the reveal. 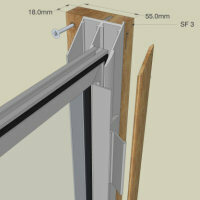 The SF3 subframe can also be used to face fix the secondary glazing directly to your existing windows, where the extra depth is useful for keeping your additional secondary window away from the existing window handles. 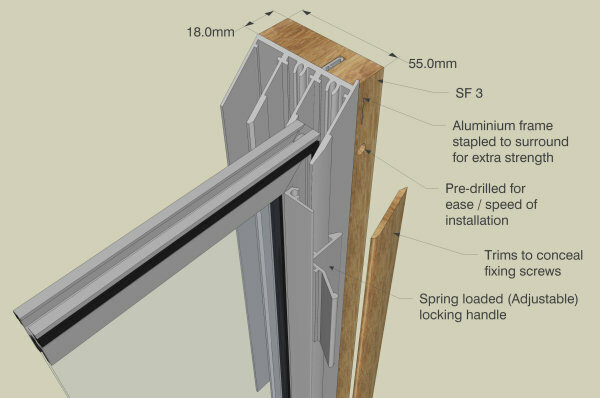 With our unique triple track horizontal sliding secondary the SF3 is used for face fixing your secondary glazing to your existing windows. The SF4 has been designed to proved the option of reveal fixing for the triple track secondary units. The SF4 protrudes out 15mm for fixing through. The pictures below show the difference between the SF1, SF3 and SF4 subframe's. 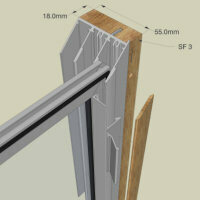 We offer a range of complimentary trims to cover up your subframe and fixings. Click here to find out more. 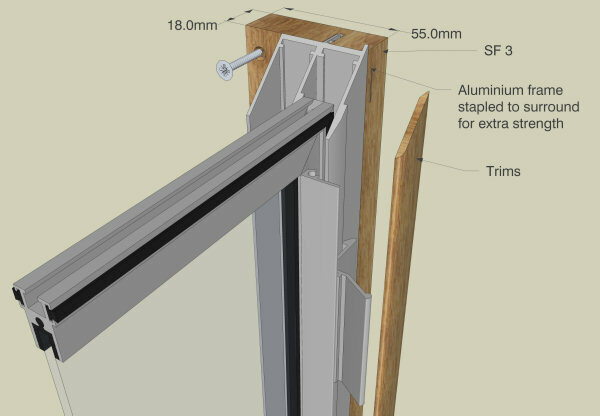 Please note: If you wish to order our SF4 extra deep subframe (for reveal fixing our triple track) - you can not currently quote for it using the online estimator. Also if you wish to have your subframe pre-drilled you need to state this at the time of order.